I have been off the grid for about a month busy with the holidays, a large family and my menagerie. However, the painting continues if not my blogging and Facebook postings. We have been having an extraordinary December here in Washington and I am loving the springlike weather. I know there are those wishing for cold and snow more appropriate to the season. I am not in that camp! BUT, when it comes to winter paintings a little snow can be an asset. 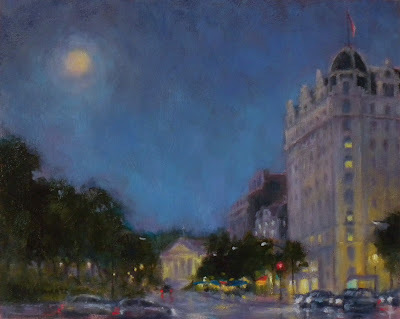 Back on October 11th I posted a little painting called "Willard Hotel Nocturne" which was a memory from a balmy summer night. The painting above is also a memory as any snow this December could only exist in the mind :-) My husband and I have spent many a pleasant evening dining at the Willard Hotel the front of which sparkles all winter. This beautifully restored Washington landmark is full of history and for me, wonderful memories. 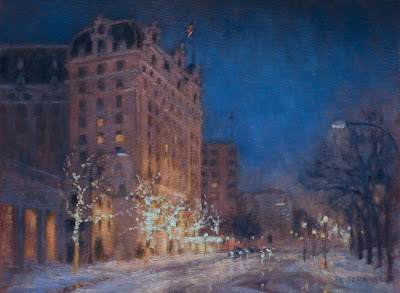 So here is the Willard on a snowy, slushy night. This painting as well as those from the October 11th post have all found new homes. Perhaps the buyers have good memories of their own. 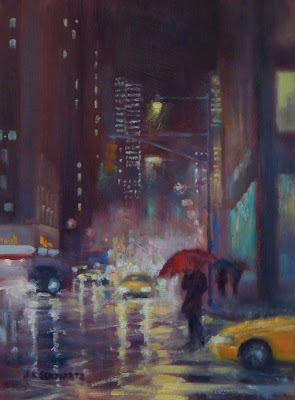 The little painting below, which I painted last week, is much more in keeping with the weather we have been experiencing.The night was warm, rainy and a little foggy. I experimented with a different, limited palette. I used Indigo, Cadmium Turquoise, Alizarin Crimson, Yellow Ochre and White. I used a palette knife, a credit card and a one inch bristle brush to paint this as I wanted to keep it loose. I have been busy getting ready for upcoming small works shows and just finished a seventh small painting which will cover the two shows I am entering. This one is of the George Washington Bridge over the Hudson connecting NYC to New Jersey. It was a pleasure to paint it and I wonder why it is the first time I have done so. I have crossed that bridge easily over a thousand times in my life. First as a child visiting relatives or doing holiday shopping in NY, then as I grew older going to the city with friends and after graduation commuting to work from New Jersey to downtown Manhattan. I vividly remember the views which are beautiful and the bridge itself which is so graceful. I also remember thinking how exciting it was to have the lower level added in 1962. I have the feeling I will be doing more paintings of the GW Bridge! Today is the summer solstice and the heat and humidity have been hitting DC hard all week with another to follow. This time of year the sky becomes milky and the atmosphere hazy. The painting above was just completed and should give you an idea of what I mean. For those of you who are local, the view is from the middle of H St. just beyond the corner of Lafayette Square. I am looking towards 15th Street which would be two traffic lights up. As my recent work has concentrated on cityscapes I am often asked why and who inspired me. The answer is I have always enjoyed viewing urban paintings but didn't feel I wanted to paint them until I saw the George Bellows exhibit at the National Gallery of Art in DC. I have long been a fan of his "Lone Tenement", which is in the permanent collection, but for the most part I was just aware of his boxing paintings and social commentary drawings. The exhibit was full of large, wonderful paintings of New York that brought to life many of the stories my parents, aunts and uncles had told me. 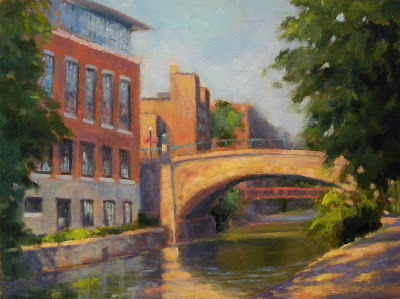 I left the exhibit itching to try my hand at painting the city and lucky for me I live just across the river from a beautiful one! I have always loved city life as three of the greatest have been part of my experience. I have lived in New York City, Paris and now Washington DC. There are plenty of talented living artists to be inspired by as well and I follow the work of Ben Aronson, Greg Gandy, Jeremy Mann and Shelby Keefe. I am glad to include a woman in that list! 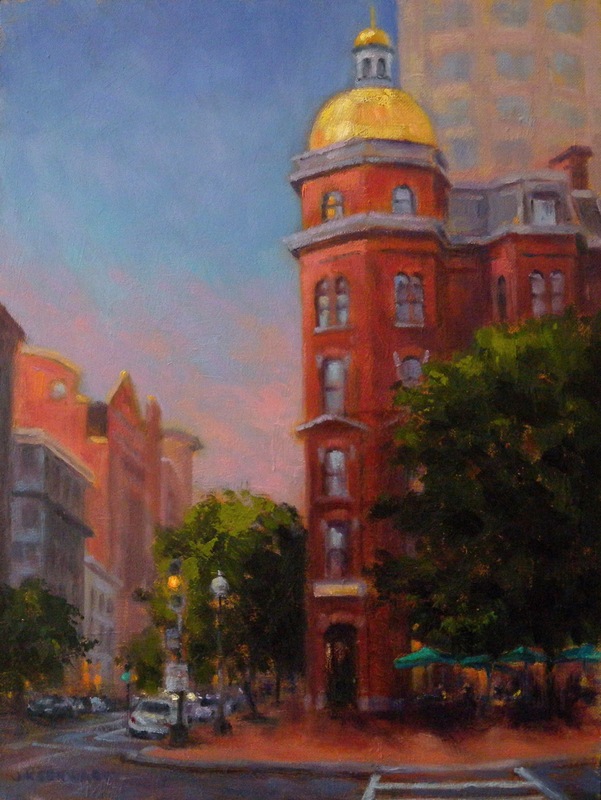 Cityscapes seem to be dominated by male artists and I am not sure why that is so. Anyway, this artist is hooked for now and I can't wait to dig into the next one. 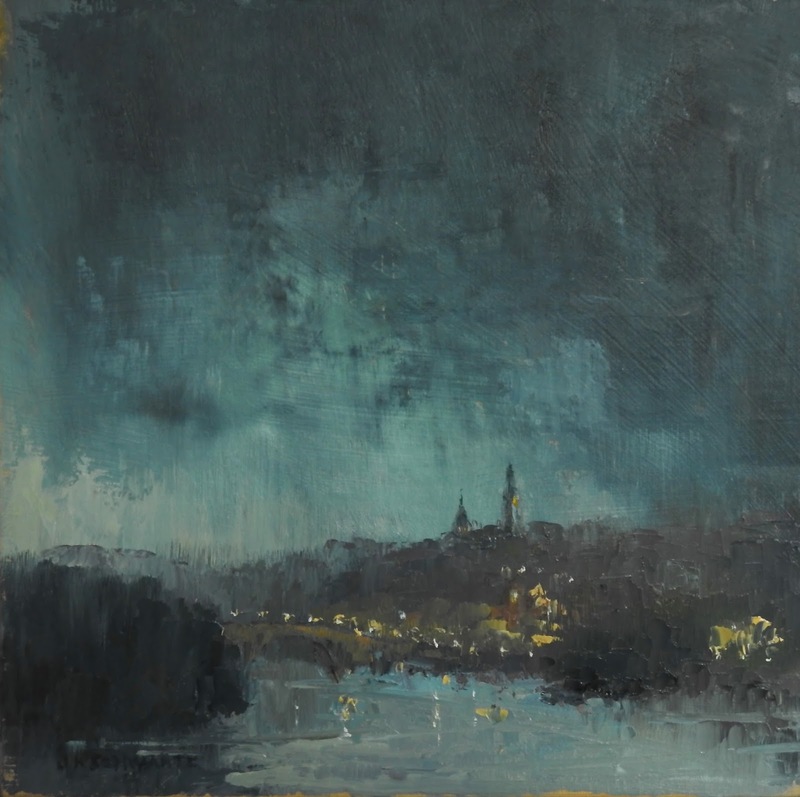 I am thinking a nocturne or evening painting. I want to play with lights again! ON EXHIBIT: "Wonderful Washington" at American Paintings Fine Art, 5118 MacArthur Boulevard, Washington DC through September. I have 5 cityscapes on view in this exhibit as well as some small landscapes from the DC metro area. Two weeks ago we spent a very pleasant time at our house on the Outer Banks of North Carolina. 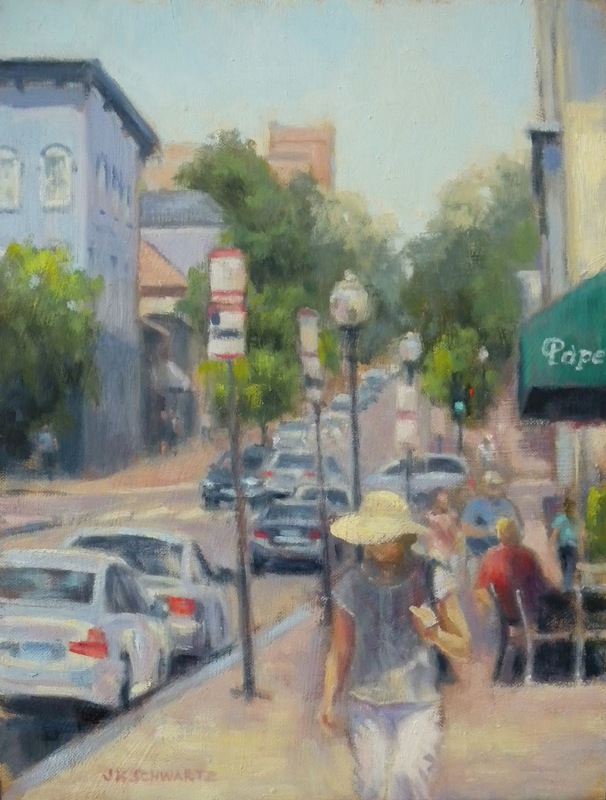 Being there offers lots of time for me to paint and plenty of wonderful subject matter so different from what I see at home. One of the things I enjoy doing while there is setting my easel up on our west side deck overlooking Currituck Sound and waiting for the sun to set. Then I paint as quickly as possible enjoying the freedom of just working with color much as I used to do when I painted abstracts. This one was created loosely, defining the cloud formations and brushing in broad areas of color as I was seeing them before me. 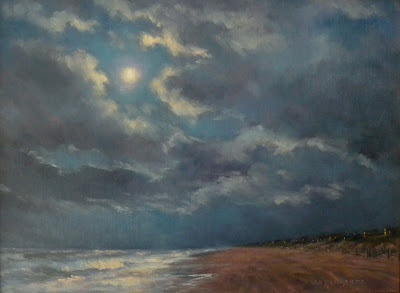 Then I photographed the painting and the sunset and completed the job the following evening. Even though the clouds weren't the same I was lucky and the colors were. I had enough light from the well lit room behind me to continue at this stage when the sun was below the horizon. I loved being able to add the twinkling lights on the mainland across the sound. This much smaller, 6x12 inch painting was painted very rapidly all in one session. I stood under the gazebo on the deck placing my easel behind one of the corners so I wouldn't be blinded looking into the sun. I would step back and forth between the light and my panel and I can tell you I was seeing spots quite often! It is exciting and challenging to paint like that particularly trying to capture the extreme light. Concentrating on painting the sky like this not only creates new paintings but I can use them as references for skies I want to paint in future paintings back home. As cold and miserable as this winter was I have to say the skies we experienced will be missed by me. 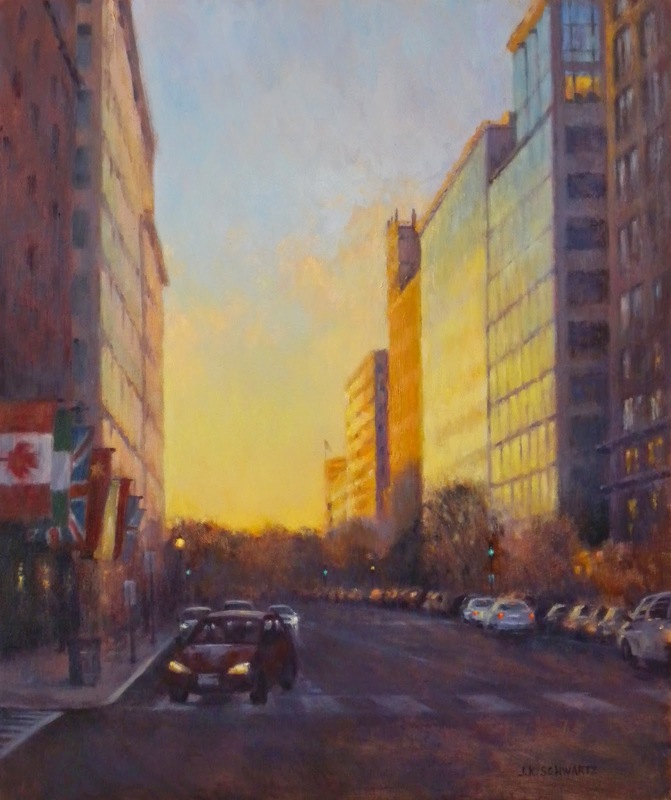 There is just something about the late afternoon and early evening light in the winter that really attracts me and makes me want to paint it. The painting above is a December painting. 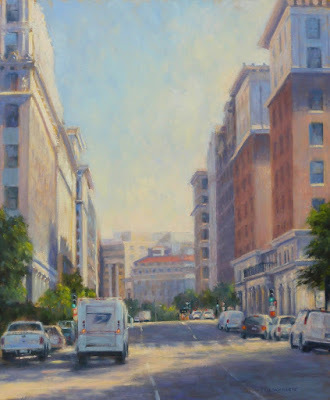 I was at the E Street Cinema with a friend to see "Mr. Turner" (which was wonderful) and when we exited the theater around 4:00 that afternoon we were treated to this view up E Street looking towards Pershing Park. I stood in the middle of the street and snapped as many photos of the light as I could because it only lasted a few moments. The flags on the left are outside Harry's Pub at the Hotel Harrington and I thought they were perfect for the foreground. Below is the last winter scene I painted this year and it was just as all the snow was beginning to melt after one snow storm after another had dumped heaps of snow to be piled on the side of the roads. 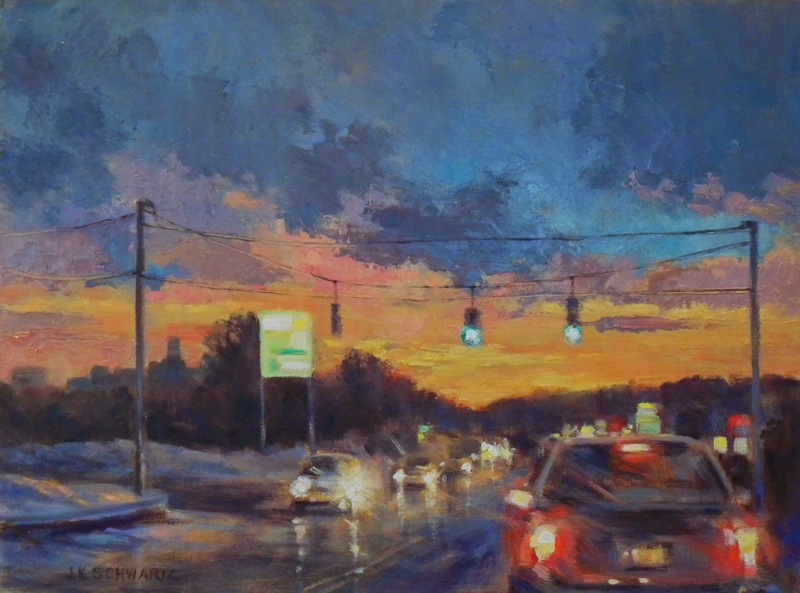 Although this painting is of a road here in northern Virginia the scene could be almost anywhere on the east coast and I am sure it will be familiar to many. The title is "Late Winter Commute". 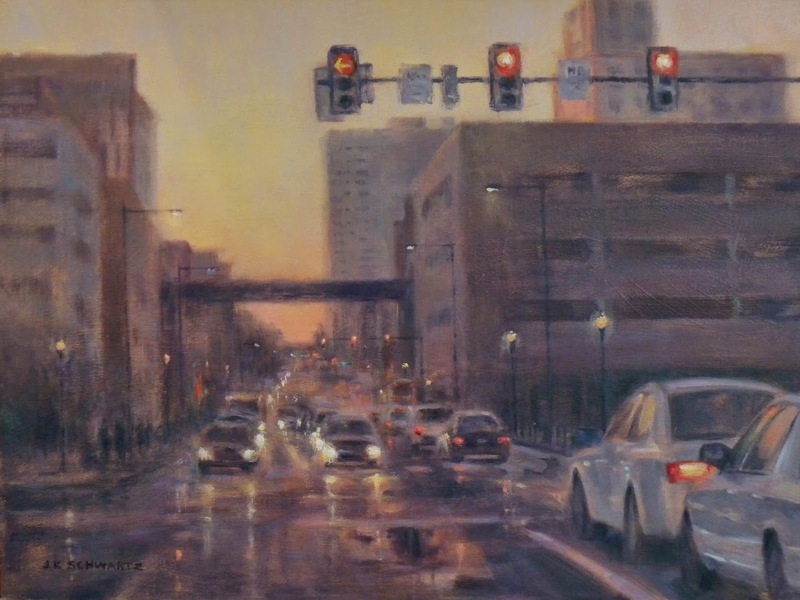 It is not everyday that I receive an honor such as this so please understand how very happy I am to announce that "Market Street Lights" received the Salmagundi Club Award in the current exhibit "Urban Life". Happy is an understatement, ecstatic is more like it! Sadly I could not be there to accept the award but spoke with a fellow Salmagundian before the reception so she could accept for me and express my sentiments. I was short on both time and money and the snowy deep freeze we have been in further complicated a trip to NYC. 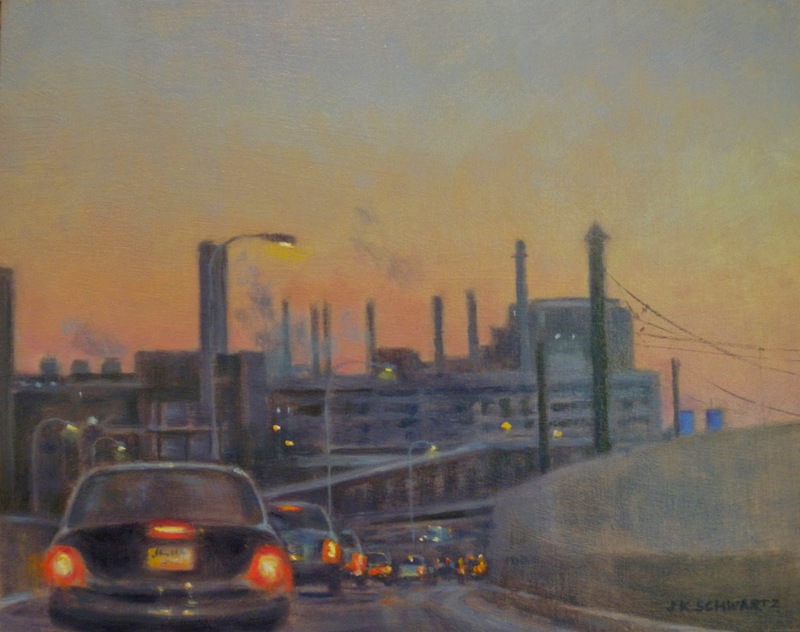 At the end of this post I will add my second painting in this show, "Leaving Philly". Speaking of the deep freeze.....Usually at this time of year we enjoy some unseasonable warmups to remind us that spring is around the corner. 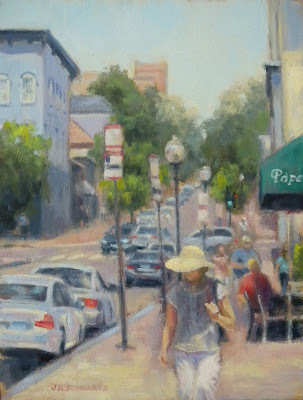 Last year during this week I was painting along the Potomac in Georgetown peeling off layers as the hours went by. It was a wonderful day to be out painting. No such luck this year and the forecast is for more of the frigid weather. 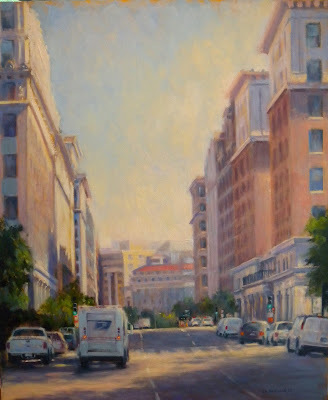 I am eager to get back out and paint and might steel myself for an attempt with fellow members of the Washington Society of Landscape Painters next week. I can promise you whatever I manage to create will be small and executed very quickly! So here is the second painting in the "Urban Life Exhibit" at the Salmagundi Club www.salmagundi.org.